MAPEI's culture of innovation and excellence is rooted in the company history. Founded in Milan, Italy by Mr. Rodolfo Squinzi in 1937, MAPEI grew from a small wall-paint producer into a specialist in adhesives and sealants for building during the 1950's. 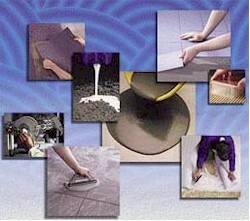 Under Mr. Squinzi's leadership, the company developed its first adhesives for ceramic tile in the 1960's. Rodolfo Squinzi called the company "Materiali Ausiliari Per Edilizia e Industria" (Auxiliary Materials for Construction and Industry) and today the company is still referred to by this original acronym, MAPEI. Strong from its success in Italy, MAPEI began expanding across Europe in 1967 and into North America in the 1970's. Since 1989, MAPEI has rapidly created successful subsidiaries in Europe (United Kingdom, Spain, Germany, Czech Republic, Germany, Hungary) and the Asia-Pacific region (Singapore, Malaysia, Australia). MAPEI distributes products throughout Latin America and the Caribbean, and recently completed a new plant in Venezuela. MAPEI is a unique company. It has transformed itself from an enterprise of the Italian craft tradition into a global scientific and technical leader in its industry. Today, from the world headquarters in Milan, Italy, Dr. Giorgio Squinzi, the founder's son, is leading MAPEI into the next millenium. Mr. Nick DiTempora directs the company operations in the fast-growing Western hemisphere. To become a leader in any industry, a company needs to provide value. Sometimes simply offering a product at a low price does not always produce value - like the old adage says,“You get what you pay for”. At MAPEI, we proudly offer a Value Advantage for tile & stone installation, floor covering installation, and for concrete restoration. MAPEI’s Value Advantage begins with using only the highest-quality, highest-performing ingredients available in every product. In some instances, ingredients can’t always be purchased from outside suppliers that meet MAPEI’s strict specifications. As a result, MAPEI has developed state-of-the-art manufacturing facilities capable of producing the technologically-advanced chemicals and polymers that are needed to meet our superior performance standards. Using some of the industry’s best chemists along with cutting-edge scientific equipment, MAPEI now produces an advanced polymer technology that is the envy of the industry. This attention to detail has allowed MAPEI to ensure that only the best quality materials are used and that product performance is second to none. Remarkably, even MAPEI’s lower-priced products have been known to out-perform some manufacturer’s top-line products. Now, just imagine the incredible performance and tremendous value MAPEI’s top-line products have to offer! The very best aspect of the MAPEI Value Advantage is rooted in our product line development. MAPEI has taken years to perfect a system approach to solving project challenges. "Whatever the surface, MAPEI has you covered!" has been our rallying cry. Sometimes customers have to buy certain products from one manufacturer for surface preparation, others from another manufacturer for installation, and maybe even another manufacturer's products for heavy-duty concrete restoration. So many different companies, so many different products, so many different warranties – what a hassle. Now a complete solution can be provided by one manufacturer that is designed to work perfectly together and is guaranteed.